HAMILTON: Defiant centuries from Soumya Sarkar and Mahmudullah were in vain as Trent Boult’s five-wicket haul gave New Zealand a crushing victory over Bangladesh in the first Test by an innings and 52 runs in Hamilton yesterday. After the stubborn double-century partnership took Bangladesh to 361 for four in their second innings, Boult opened the final chapter of the Test when he bowled Soumya for 149. The crucial wicket ended a 235-run stand with Mahmudullah (146) for the fifth wicket and saw Bangladesh cave in with the Test all over 68 runs later, just after tea on day four. “The fight today was as tough as Test cricket does get,” New Zealand captain Kane Williamson said after Boult’s lethal spell with the second new ball trumped the 54-over battle by Soumya and Mahmudullah. It was Soumya’s maiden hundred and the fifth and highest century for Mahmudullah as they pounded the boundaries and took control of the short-ball barrage that decimated their first innings. “That plan didn’t work very well for us today and we had to go back to trying to stop some scoring for a period of time, because they were scoring quickly,” Williamson said. “There was some fantastic batting. “When the breakthrough came with the second new ball, which was obviously a fairly long time coming, it was great that we were able to open up an end from that point on.” The match had belonged to New Zealand long before they declared their first innings at a colossal 715 for six-a first innings lead of 481 — but Soumya and Mahmudullah were determined to make crossing the finish line as difficult as possible for the hosts. 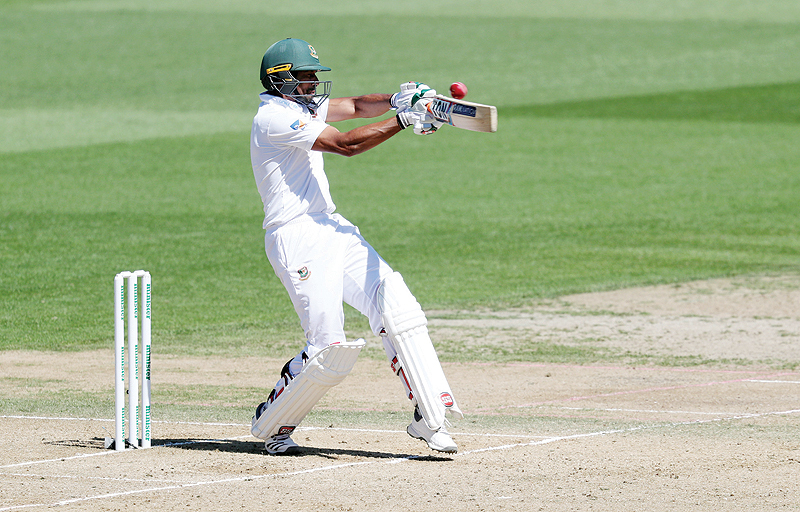 Mahmudullah called it a “gutsy innings” as they batted together for nearly three sessions and produced the sixth best partnership by a Bangladesh pair. When Boult finally bowled Soumya, the 26-year-old left-hander stood motionless for several seconds as he realised the significance of his wicket before departing the ground. The remaining five wickets lasted only 18 overs. When Bangladesh resumed Sunday on 174 for four they faced a Herculean task to score a further 307 just to make New Zealand bat again. Sri Lanka’s Angelo Mathews and Kusal Mendis proved with their (rain-assisted) match-saving 274-run stand in Wellington before Christmas it is possible to defy the odds in New Zealand.